HOW IMPORTANT ARE YOUR PHONES TO YOUR BUSINESS? Many of our customers are moving their data to the cloud to provide better and easy anytime/anywhere access to important documents. While access to those documents is important, they understand that voice communication with current customers and prospects is of utmost importance. Power outages can be caused by weather, technology or human error – These events will take out most companies’ ability to keep their communications running seamlessly. With organizations cutting back on capital expenditures, traditional phone systems are being pushed beyond their expected lifespan. 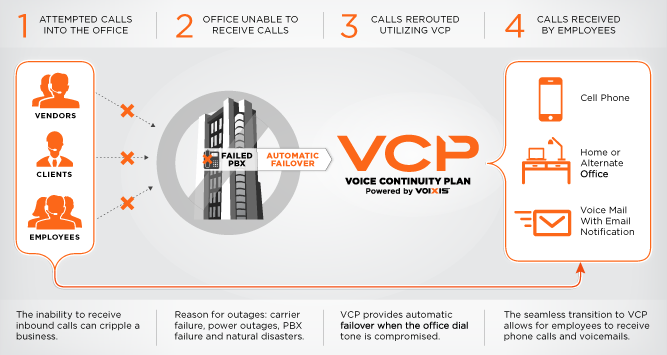 As a result, PBX failures are impacting what should be reliable voice communications. With the changes in weather patterns, we are experiencing more and more natural disasters. These situations may prohibit access to a corporate facility or impact the full voice functionality of that facility. There are many advantages to digital circuits, but the one downside is it can have a significant impact on the way a company is able to communicate when those circuits are compromised. The VOIXIS Voice Continuity Plan (VCP) will allow your company to remain in contact with your clients, customers, partners, and suppliers in the event that your traditional communications is compromised. VOIXIS is the first to market with a telephone back up solution that addresses these situations. In today’s day and age we need to be accessible and responsive at all times, an outage is no excuse. Traditionally, when your service is compromised, your customer will get a fast busy signal and will not be able to reach their intended party until the issue is repaired. With VCP those lost calls would be re-routed to our cloud based system that will handle all your calls. Via your customized auto attendant, all your calls will be routed to the intended parties. Too often organizations find themselves hastily creating a disaster recovery plan. VCP helps you become proactive. This solution is extremely customizable, allowing you to create your predefined contingency plan. It becomes an internal decision when deciding how calls should be routed. Do you want every employee accessible via voice lines? Do you want to route your current extensions to individuals cell phones? Do you want some employees to solely receive voicemails via email? Do you want to route departmental calls to your POTS lines? Do you want to set up text message notification to let employees know of new voicemails? Are there employees that would want to route calls to their home office? These are just one of many questions to consider… Rather than leaving your clients wondering when your phone service will be restored, implement VCP, a solution that will keep your organization functioning at all times.